The team has changed up its formation with three in the back, five midfielders, and two up top with Chris Wondolowski and Danny Hoesen. Wondolowski has been absolutely on fire, scoring ten goals across all competitions. The shift away from a 4-4-2 has allowed San Jose to build from the back and dictate the pace of the game. This has really allowed the Quakes to control possession nicely and utilize the middle of the field, which has repeatedly sprung Jahmir Hyka and Tommy Thompson (more on Thompson later). When you combine the sudden uptick in offense with what has been a solid defense all season long, many experts are prognosticating big things for the second half of the Quakes 2017 season. 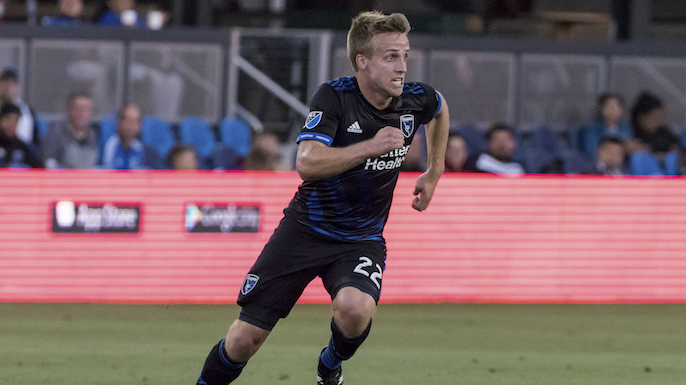 Thompson is the first true home-grown player in Earthquakes franchise history, and he has long been pegged to be a franchise star. Making his debut as an 18-year-old back in 2014, many could easily see the talent was there, but it didn’t always translating onto the pitch. This year things have started falling into place for Thompson. He scored his first career goal on the 4th of July in a road loss against Atlanta United. and since then Thompson has been simply embarrassing defenders with his handles and footwork. He has been a workhorse for the San Jose midfield, and is impacting the game on defense, in transition, and in the attacking third. Still just twenty-one years old, 2017 is turning into the breakout season Thompson, as well as Quakes fans, has been waiting for. Watch for him to have a big impact on today’s match. The Quakes will still be dealing with international absences due to the Golg Cup, with no Marco Urena, Anibal Godoy, or Darwin Ceren. That’s obviously not ideal but the Earthquakes saw their new designated player, Vako Qazaishvili, make his debut this past Friday night in a friendly against Eintracht Frankfurt, and it’s possible he could make his MLS debut Wednesday against the Red Bulls. Against Eintracht Frankfurt Vako showed great speed, ball control and on several occasions saw 5 defenders lock in on him, opening up possibilities for others in the offensive end. That is exactly what the Earthquakes wanted to see from him in his debut: the raw potential to disrupt a game. The Quakes also saw many injured players make their returns to the pitch on Friday night. Marc Pelosi (missed all of 2016 and has not played in MLS yet in 2017 with patellar tendonitis and knee surgery), Quincy Amarikwa (out since late 2016 with a torn ACL and subsequent corrective surgery) and Fatai Alashe (out the last few weeks with a knee injury) all subbed into Friday’s match in the final thirty minutes, and looked like they were ready to bolster the depth and talent of a Quakes squad that had been stretched relatively thin as of late. San Jose enters Wednesday’s match sitting at 5th in the Western Conference with 26 points and a record of 7-7-5. The Red Bulls are 7th in the East, with 26 points and an 8-8-2 record. Broadcast starts at 4:30 on KNBR 1050.